Sorry I couldn't get this posted for yesterday. I was playing mental health non-professional for the day, emphasis on "non-professional". All's good now, but I was wiped out for a day. Back, now, though! 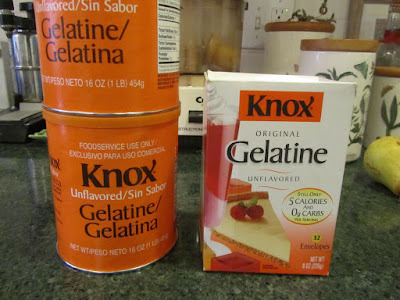 So, in posting about what I bought, grocery-wise, for August, I mentioned that I finally got around to restocking our supply of unflavored gelatin. Previously, I had bought this in individual, four 1/2-cup serving each, packets, through Cash & Carry. It was still a pretty good deal from Cash & Carry, but I was looking for a less expensive way to purchase gelatin. And as I bought this through Amazon, this is a purchase any of you would be able to make. So, thought I'd share just what a good deal this is. I also use gelatin in chiffon pies and sorbet. Pumpkin chiffon pie is my family's favorite version of pumpkin pie, as it's light and airy. I make this pie several times per year. Another favorite of ours, using gelatin is Chocolate Bavarian Pie -- a whipped, mouse-like chocolate pie. I've also turned orange juice concentrate plus gelatin and sugar, into an orange chiffon pie, one year, when needing a dessert, was about to move, so had an otherwise empty pantry. It was surprisingly good, for such an ad lib, last-minute dessert. So, that's primarily what I use unflavored gelatin for. Unflavored gelatin has an unlimited shelf life, if kept cool and completely dry. As for expiration dates on gelatin, it actually has more to do with the packaging breaking down, rather than any deterioration of the product. So, stored properly, so no moisture gets into the dry product, my unflavored gelatin should last as long as it needs to, before consuming all of the product. Once opened, a canister like this can be transferred to a glass jar with tight-sealing lid, or the entire canister can be placed into a gallon-size ziploc bag. Buying in a canister is 60% cheaper than buying in packets through a wholesaler!! For our home, the real value to buying unflavored gelatin is in transforming something that's become humdrum into something new and different. When using produce that is primarily only what I grow, for a season, there can be a lot of repetition. I don't have the option of just not buying more rhubarb next week, if we're tiring of rhubarb. When next week comes, we still need to eat rhubarb. As a result, we eat a lot of rhubarb sauce and blackberry-rhubarb sauce in our family. It's made with fruit from our own property and is almost free. The only cost is the sugar. When we tire of the fruit as sauce, I can use a little unflavored gelatin and transform it into a fruit jello, adding a bit of interest to a food that has become boring. And trust me when I tell you that packing a container of fruit gelatin is so much neater in a backpack all day, than a similar container of fruit sauce. I had been purchasing my gelatin from a spice wholesaler. Last time a package was reduced at my local organic food store. I like you thought " I don't think it expires?" We don't have the food option for Amazon where I am. Good for you. When my children were little I used to make 9x13 dishes of juice gelatin all the time. Think it's time to make some again. I'm glad you've found a local source for less expensive gelatin. Those tiny packets at the grocery store are expensive. Isn't that funny -- you know, I'm not sure I know very many people who make jello this way either. My mom used to make aspic regularly, with tomato juice. I hated it as a child, but love it now. And that is what really got me to thinking about making jello from all kinds of juices and fruits, when my kids were little. And I've always loved that this kind of jello actually has nutrients in it, in contrast to the fluorescent packaged stuff. I never thought that your gelatin purchase was odd at all. After all, home-made gelatin was the reason you and I met! LOL But this is a great post, great analysis, and great potential resource! Thanks so much for taking the time to post it! I may definitely have to look into this. Glad that the "life" issue is under control. :) I can sure relate (and bet a lot of others here can, too) to being the go-to mental health non-professional for quite a few people! It can be a blessing to be able to help, but grueling, often, too! PS...Our younger son and I WISH we had your problem of "having" to eat rhubarb every week! We had a plant going here, but lost is over the winter from drought, just as it was getting old enough to really bear properly. Yes, ha ha! That is how we connected -- over fruit juice gelatin!!! Who else could possibly say that?! Oh, no! That's such a shame your rhubarb didn't survive. I hope you can find another root division, to try again. If you lived nearby I'd give you a division from mine. My MIL once told me that she grew rhubarb in a large pot, like a half barrel. Would growing in a pot/barrel be better or worse for your area? You might be able to monitor the water in a pot, better than in-ground. I don't know. Thanks for your kind wishes! Have a great day! In the spring, IF we have some snow/rain over the winter, I'll try to get a new division started again. If it's another dry winter, though, I'll just wait. I'm really worried that they're going to start capriciously limiting our water use, so I can't face committing to too many new perennial plants/trees. Interesting idea about the half-barrel. Not sure if that would be better or worse here. Things generally do better in the ground because of the low winter temps freezing potted things faster. But the issue I had with my rhubarb (totally my fault) was that we put the hoses away in the winter, so they won't burst. So, if there's not enough natural moisture, I have to carry buckets. I tore my bicep, and couldn't haul much at a time. I did what I hoped was the minimum to keep it alive, and it wasn't enough. A half-barrel closer to the spigot might be an idea. I do have a similarly-appropriate site closer, as long as I can keep it fenced from critters. If I DO get another rhubarb, I'll definitely consider starting it there, and maybe in a barrel! Thanks for the idea! Oh yes, freezing and roots when in pots. I believe my in-laws were living in Kentucky when my MIL grew rhubarb in a large pot. Winters were likely milder? Even if a half-barrel near the spigot wouldn't work, possibly, in-ground, right there at the spigot. In our last place, we had a hydrangea bush right at the spigot. That was the most luxurious-looking hydrangea that I've ever seen! I am one of those weird people who absolutely hate eating Jello, but I use gelatin in pies and panna cotta on a somewhat regular basis. Today I am experimenting making a meltable, grate-able non dairy 'cheese" . If it tastes good enough to use regularly, I can see my gelatin needs increasing dramatically. Thanks for the info! Good luck on the "cheese" experiment! Hope it works out well for you. Would be a wonderful thing to be able to make! Now there's one I'd not thought to try making -- a cheese-like substance. What are you using as a base? What an interesting experiment! Best of luck with it! Thanks for the information, Anne. Very interesting, and using ingredients that I would not have thought of using in a mock-cheese. I'm inspired to use our old boxes of unflavored gelatin!! We hardly make jello except to keep a few boxes on hand in case the grandkids are over. They're not great jello fans either but with whipped cream, they are. 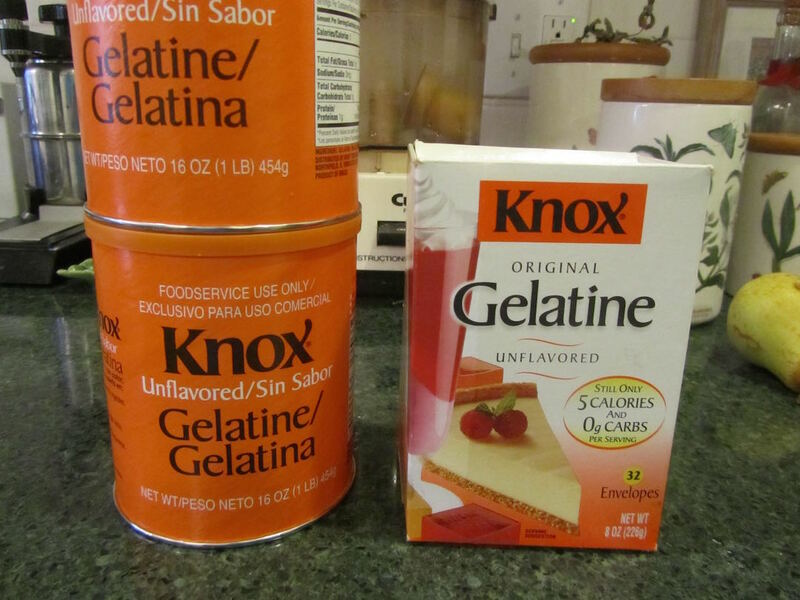 I have more time at home nowadays, so I can't wait to revisit unflavored gelatin. Thank you for your recipe and directions. Thanks for the heads-up on the AMEX w/ Amazon offer. I don't have an AMEX, but this might be helpful to someone else, here! For your grandkids, YHF, you might want to try grape juice gelatin, with your unflavored packets. It's pretty good. I'm also a big fan of cranberry juice gelatin. Thanks for the suggestion, Lili. For some reason, they don't like grape jello, mostly the green one which is lime. But I'm sure grape juice tastes a lot better than artificial grape flavoring. I love cranberries, and can't wait to try out the juice in gelatin form. Great suggestions, thanks!! I wish I had a better system to remember all the good tips and advice from your blog. I think I need to start a journal or notebook of thoughts and ideas as they come to me without worrying where to file it. I'm having "aging" issues, such as memory loss probably from max dose statins, and can't remember from one day to the next. Sorry about the statins. They've been tough on my mom, too. I agree with Lili, Cranberry makes great gelatin, as does pomegranate (and that's a pretty color, too.) But we've found pretty much any juice (or juice blend) you (or the kids) like to drink, they might like in gelatin. Our favorite is actually apple cider. So light and refreshing. But we've gone as wild as papaya juice, and had good results. It's thicker, unless you add water or some other kind of juice. (And okay, not thrifty! LOL) But really interesting! YHF -- I couldn't remember which year we were in, last night at dinner. Oh did my 3 kids ever get a good laugh out of that one. I blame it on terrible sleep, too many nights, weeks and now months in a row. Another thought on the homemade jello for grandkids, seeing as how they love lime jello -- lemonade jello, made with bottled lemon juice, sugar, water and gelatin, or pink lemonade jello, the lemonade jello, but with a splash of any pink/red juice. I actually have to admit, green jello and green koolaid are my two favorites. It doesn't taste anything like lime, but I've always loved those two. You may want to get the grandkids in on the making of the jello, too. Or let them choose the flavor. Could be a fun project. We seem to eat the same old food items (buy and prepare the same old food the same way), but Lili's blog is expanding our repertoire of foods that we now eat by suggesting different foods and preparation methods (all frugal to boot!!). Last week, my husband prepared pickled ginger, splurging on some young ginger ($3.99/lb) from a farmer's market. He enjoyed the pickles and when it came down to the last few morsels, he was about to throw the entire jar away when I intercepted the pickled juice and soaked some Kang Kong (ungchoi) that I had just blanched. It tasted pretty palatable, and another way to eat the vegetable that grows like weed on our lanai. It was an expensive jar of pickles that he ate, so I felt pleased to have reused his expensive ginger infused pickling juice to flavor another dish. Before Lili's blog, I don't think it would ever occur to me to try that. My husband kept saying, that's crazy just throw it away, but I am glad Lili set the example for us. Sara, sorry to hear about your mom. I've heard other people blame early memory loss on statins too. Just too bad we are the guinea pig generation, and the jury is out whether statins are for better or worse. YHF, if you want to use the extra ripe papayas in gelatin, you'll need to cook it first. Fresh papaya, figs, pineapple,mango, prickly pear and kiwi all contain an enzyme that prevents gelatin from setting. You can gently boil any of the above, except the kiwi, for about 5 minutes, to denature the enzyme, and your jello should set. this is why canned pineapple will work in jello (it's been heated), but not fresh -- that enzyme. Any of the canned juices of these fruit will work, too, as they've been heat-treated, too. Good job on getting delicious use from the ginger pickling juice!! 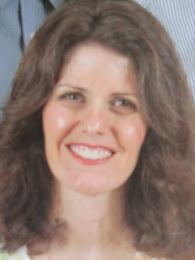 And just to let you know, there are a lot of things that when I first began doing them, my husband would scoff and say it wasn't worth the time. Well, guess who's on board with those little things, now! Husband! Thanks for the reminder...as you can see I'm posting when I should be sleeping. But that thought that I must cook the papaya entered my head just as I was going to check for your next day post. Lol...exactly!! My husband is coming around and loving all your frugal suggestions. Guess who made the last batch of bean patties!! I'll look for the gummy bears recipe, YHF. It was good, and actually traveled fine the 500 miles in the mail un-chilled to our son. I'm thinking of making some more for a road trip that's upcoming. PICKLED GINGER? Now THAT sounds DELICIOUS! Good work "Mr. YHF"!!!! I love fresh ginger and crystallized ginger, and have made some delicious ginger preserves in the past. Yummmmy! We don't eat a lot of jello at our house either. My husband spent a lot of time in the hospital when he was a little boy and that's what they serve in hospitals. He hates the stuff. I make it probably once per year and he won't touch it. Why push the issue, right? I have made finger jello for the kids when they were young but those days are gone. I still have a box of the little packets of gelatin in the cupboard and yes, they stay good for a long time. I'll never need to buy it in large quantities! now there's an unpleasant association -- jello with hospital stays! I'm sorry he had to endure time in the hospital as a child. Not something any of us want for our children. Your unflavored gelatin will probably last another decade or more. You might want to use it to make sorbet, or something like that that doesn't have the "jello texture". 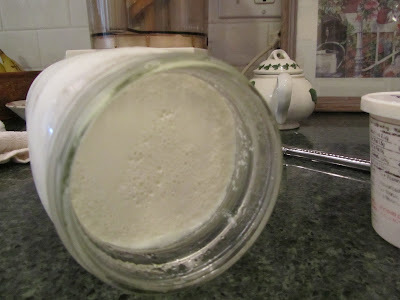 I don't make much jello but have been using the unflavored stuff to make homemade marshmallows. Yum! Although not really cheaper than store bought. I am also really intrigued by panna cotta, but am not sure I would love the texture. I grew up with a lot of jello salads and while I like some of them very much, I think it was a little bit of overload (always several on the table at any church dinner and at least one when we had company) so I don't really make them myself now. But a cool mandarin orange creamsicle jello sounds really good right now! I forgot all about marshmallows. I've never made just straight marshmallows, but when my kids were small, I made Easter Peeps for their Easter baskets. And those used gelatin, too. Hmmm, now you've got me thinking! I get you, on the covered dish suppers at church. Some dishes seemed to be staples. In more recent years, I think I've eaten every possible combination of pasta salad. Oh, yum that mandarin orange salad sounds good. Laura, I had always turned my nose up at panna cotta, since I never liked jello. Bad move on my part since it is delicious, creamy and light. It's a very quick dessert and adapts to so many fruit variations. My mother always made homemade marshmallows at Christmas,, sometimes rolled in toasted coconut , sometimes fine powdered sugar and sometimes chocolate. Oh those marshmallows sound divine! What a wonderful memory to have! Lots of great ideas in this post as well as the comments. I rarely make "jello" but am thinking maybe I should as a way to get more gelatin in my children's diets. And if you end up needing even larger quantities at some point, you might check Azure Standard. I have bought their bulk beef gelatin before, and in the 5 lb bags it comes out to $7.26 per lb at current prices. But it IS a LOT of gelatin. I primarily bought it that way when making our own dog food, to add in for my elderly dog's joints as well as protein. That's good to know about Azure Standard's price on beef gelatin, Cat. Thanks! that's so interesting. I'll have to check those out. WHo would have guessed!